Posted on November 20th, 2015 at 2:28 pm. When I started getting seriously interested in bicycles a few years ago, I already knew they were pollution-free, cheap, healthy, quiet, nonlethal and space-efficient. What threw me for a loop, when I was talking to other Portlanders who were already interested in bicycles, was that they kept talking about community. Biking (and walking, and public transit) connected them with their neighbors and surroundings in a way that driving can’t. The idea, it turned out, is backed up by science. Posted on September 22nd, 2015 at 10:19 am. Plenty of room for changes. 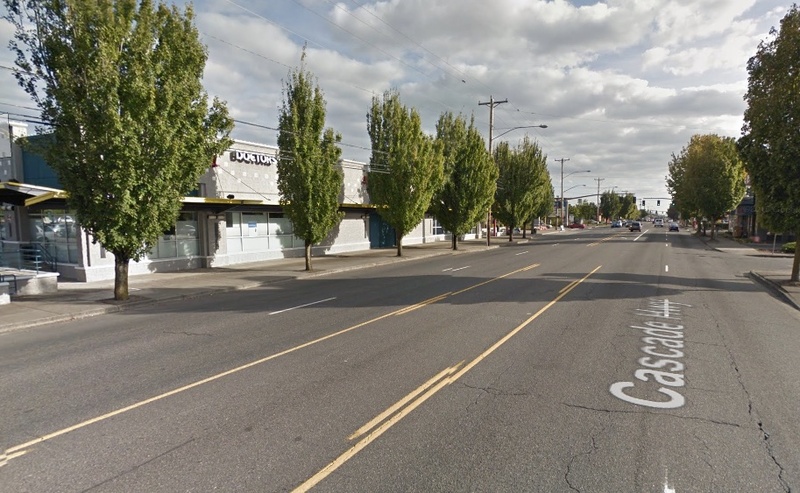 The street that once ran along part of Portland’s eastern border is now one of its most important corridors, and it’s lined up for some changes — which may even include a new bikeway. On Saturday, Oct. 10, the 82nd Avenue Improvement Coalition will host a community forum about the urban highway’s future. It’s convened by the Asian-Pacific American Network of Oregon, the force behind an effort to keep strengthening the identity of the Jade District near 82nd and Division; by state Sen. Michael Dembrow, one of the forces behind an effort to bring 82nd Avenue from state to local control; and by the Portland Bureau of Planning and Sustainability, which is updating its zoning maps in ways that could push the street away from its current highway-on-the-edge-of-town atmosphere. Posted on September 3rd, 2015 at 11:06 am. Yes, apparently city engineers sometimes use the Unipiper to designate bike lanes. We’ll call it affectionate good humor. Well, this would definitely be odd if it happened. 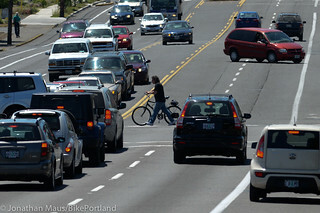 Despite a continuing gusher of evidence that adding some sort of vertical separation to bike lanes makes them much better at getting people to actually ride bicycles, the City of Portland was, as recently as April, drawing up “preliminary” plans for an entirely new street in the South Waterfront that had a bike lane painted into the door zone of a road bed. Posted on September 1st, 2015 at 11:18 am. 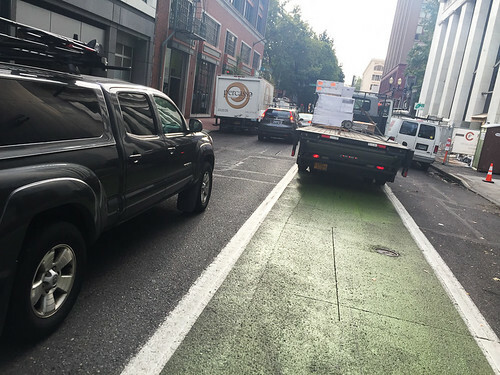 All too common view on one of downtown’s “best” bikeways. I’m not one to get upset and complain at every little biking injustice I come across everyday; but when things reach a point of absurdity and highlight a larger problem, I think it’s reasonable to make a fuss. Posted on March 24th, 2015 at 1:49 pm. 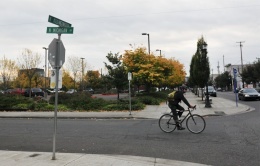 This week is Bike Week in east Portland’s Rosewood neighborhood and it’s also the launch of the much-needed cycling spark that east Portlanders have been waiting for. Posted on January 20th, 2012 at 12:05 pm. Corner of 15th and Killingsworth. 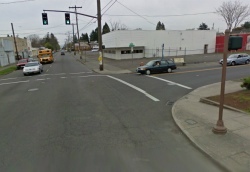 Residents of the Vernon Neighborhood in northeast Portland are organizing opposition to a proposed 7-Eleven at the corner of NE Killingsworth and 15th (map). Among their list of concerns about the potential store are how it would impact traffic safety — particularly among people walking and biking. Posted on October 26th, 2011 at 10:10 am. 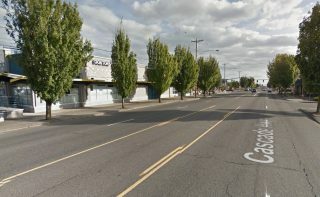 Portland Community College’s Cascade campus is considering the construction of a four-story parking garage on the northeast corner of N Michigan and Killingsworth. The project is part of district-wide expansion plans funded by a $374 million bond measure passed by voters in 2008. Posted on August 18th, 2011 at 11:37 am. Now includes a bike race, naturally. 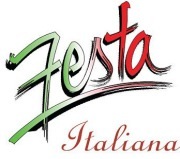 The Festa Italiana, a week-long event that has brought together the local Italian community for 20 years, now includes a bike race. The Giro di Portland will feature the area’s best racing talent on a high-speed, multi-lap criterium through the Pearl District — and the Festa Italiana is the presenting sponsor. Posted on June 2nd, 2011 at 1:12 pm. 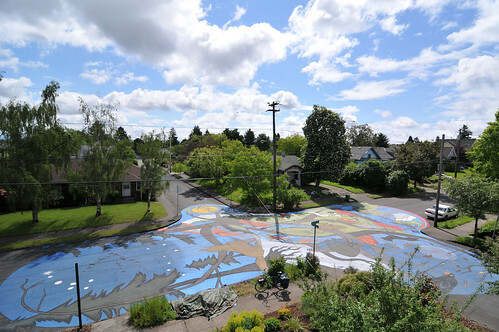 The largest street painting in Portland, as seen from a roof on the northwest corner of the intersection.